Available at both Pieminister’s Stokes Croft and Broad Quay restaurants, the new meal option is available all day, every Sunday. For £9.95 (and £1 extra for bottomless gravy), choose from any of their pie range with plenty of traditional Sunday accompaniments. 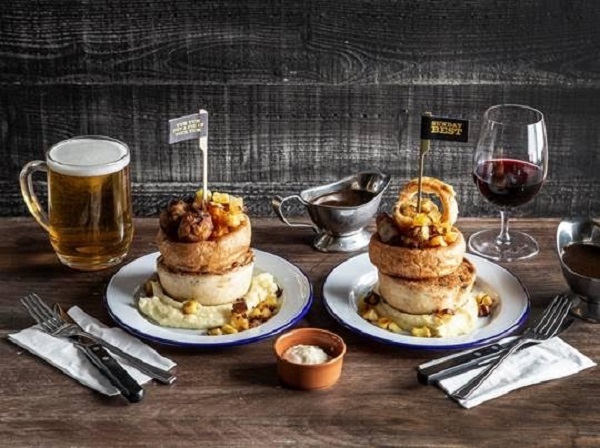 Along with the pie and the obligatory mash, your plate will arrive topped with a Yorkshire pudding filled with roast garlic & rosemary potatoes, carrot & swede mash, finished with free-range British pork crackling and a pig-in-blanket…and served with a boat of gravy on the side. There are vegetarian, vegan and gluten-free versions of the Sunday Best too of course – take a look at their Sunday menu for full detail. If you want dessert too, you can order a Sticky Toffee or Hot Chocolate pud smothered with sweet sauce and ice cream for an extra £4.95. And there’s a new addition to their Ice Cream Sundae menu, which now includes the vegan Gold Digger made with salted caramel vegan ice cream and millionaire shortbread. The autumn menu now also features a trio of Loaded Fries. Be Cheesus is a heap of fries loaded with pulled ham, dirty cheesy sauce and crispy shallots. El Toro’s fries are topped with braised beef, chorizo, jalapeños, olives and cheesy sauce. And there’s an option for vegans too, with the Cauli Gosh: loaded with crisp spiced cauliflower, curry sauce, pickles and Sriracha.